Announcement Hey friend – welcome to our shop! 17th Avenue offers stylish, customizable, and affordable WordPress Themes for bloggers & boss ladies. Hey friend – welcome to our shop! 17th Avenue offers stylish, customizable, and affordable WordPress Themes for bloggers & boss ladies. I was really well cared for in this whole process. I appreciate the time and effort to make this just-right for me! Easy instructions. Perfect for beginners! Great customer service and a discount code after purchase! I love how it looks and the very detailed instructions on how to use it. It is very clear and user friendly. As a big THANK YOU to all of our wonderful customers & friends, we are giving away a free Wordpress theme to three (yes, THREE!) lucky winners. Come join us on Instagram to enter. Ends 11/19, so hurry! 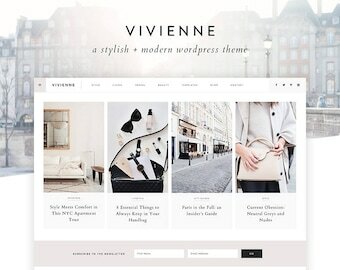 Meet Vivienne, our newest WordPress theme. She is classy, timeless, and stylish. We handcrafted Vivienne to accentuate your content and showcase your images beautifully. Its minimal style and versatility make it a wonderful option for any type of site! To celebrate, take 15% off your purchase with coupon code HOORAY. Sale ends October 2, 2017 at 11:59 PM PST. 17th Avenue is web design for creatives. For small-time bloggers. For big-time bloggers. For photographers. For business owners. For one-woman shows. For late-night-working-while-half-asleep side hustlers. We get you, because we've been there. We understand what it takes to run a blog and business. So get back to writing, blogging, photographing, selling, and being... you. We'll take care of the rest so you can keep on doing what you love. We want you to fall head-over-heels in love with your website. We want you to be proud of your online space and excited to show it off to the world. With an emphasis on gorgeous typography, responsive design, functional features, and endless flexibility, our collection of handcrafted Wordpress themes are designed to convert, sell, and positively swoon your audience. • Ultimate Flexibility – Easily customize the widgets, layout, and colors in your theme to make your website vision a reality. Your options are endless! • Fully Mobile Responsive – Our themes are expertly coded to work beautifully on all devices, from desktops to mobile phones. • Custom Details – Each theme is full of unique, designer-quality features that will set your site apart from the crowd. • Personalized Theme Support – If you have a question or need help setting up your theme, we're always just a quick email away. • Expansive Support Center – Our Support Center (https://support.17thavenuedesigns.com) is filled with over 300 WordPress tutorials, troubleshooting articles, and theme setup guides. New to WordPress? No need to worry! Our setup guides and tutorials are very thorough and easy to follow. Based out of Portland, Oregon, we breathe coastal air and dig the hipster vibe. Big cities inspire us with their bold colors, modern aesthetic, and upbeat energy - and you'll find our design style epitomizes those characteristics. 17th Avenue was founded in 2012 and we've had a blast watching it grow over the years. We absolutely love working with clients from around the world offering WordPress themes, Blogger templates, and custom web design, to bring their design dreams to life. I'm Kate, owner + theme developer here at 17th Avenue. I live in Portland, Oregon with my wonderful husband and our baby boy, Jack. It's so nice to meet you! Chief email answerer and support gal. I'm Livy, a four year old french bulldog. According to my mom, I'm the cutest troublemaker ever. woof woof! Hello + welcome to the 17th Avenue shop! We offer stylish & affordable Wordpress themes and Blogger templates for business owners, creatives, and bloggers. Since our products are non-tangible digital items and can’t be “returned,” we cannot offer refunds for WordPress themes or Blogger templates. However, we want you to be 100% satisfied and happy with your purchase. If you’re having an issue with your theme, experiencing trouble setting up, or just have a question, we want to help! Please submit a support ticket and we’ll do everything we can to assist you. If you purchased a product that is not instant download (such as installation or an upgrade), and work has not yet been started, you can request to cancel your order and receive a full refund. • 17th Avenue accepts payment via PayPal or Etsy Direct Checkout. • Files will not be delivered until payment has cleared. • Coupon codes/discounts must be applied to the original order. Refunds for discounts are not available after payment has cleared. • Our WordPress themes and Blogger templates are instantly downloadable. After your payment has gone through (usually within a few minutes), you will be able to download your files right from your Etsy account. • Most upgrade/add-on items are sent in 3-5 business days, but be sure to check the individual listings for the most accurate processing times. • Theme installation typically takes 5-7 business days, depending on our installation queue. • All files that are not instant download will be sent via a download link through Etsy conversation. Our themes can be installed on an unlimited number of websites for PERSONAL USE. Personal Use refers to sites that you personally own/operate, including business websites. For example, you could have a personal blog, a business website, and a second business website – all using the same license. The only circumstance in which a new theme license needs to be purchased is if you are installing the theme on a client’s website. In that case, you will either need to purchase a second license, or your client needs to purchase their own license. In an effort to keep our prices reasonable, we do not offer free theme customizations. This includes changes to fonts, colors, or layout. If you want to customize your theme so that it looks different than the demo, you can submit a customization request. Can you install my theme for me? Yes! We offer installation services here: http://etsy.me/2t93KXk If you're not sure what installation package you need, send us a message! We're happy to steer you in the right direction. Can you customize a theme for me? Absolutely! Just shoot us an email to inquire. We're very customization-friendly and would love to work with you. Can I add a post signature, blog button, or other add-ons to my theme? Are your WordPress themes compatible with WordPress.com? No. Wordpress.com does not support third-party themes, even if you have a custom domain or a premium account. You must have a domain, hosting, and Wordpress.org software installed on your domain to use a 17th Avenue Wordpress theme. Update 2018: Wordpress.com's Business Plan now allows themes. WE DO NOT OFFER SUPPORT OR SERVICES FOR WORDPRESS.COM SITES. If you choose to install a 17th Avenue on a Wordpress.com site, please do so at your own risk. How do I get started with WordPress.org? Is _____ WordPress theme right for me? Our Wordpress themes are incredibly flexible. Just because a theme demo is set up a certain way (for example, with food images), doesn't mean you can't use it for other purposes! Every theme has endless possibilities and can be used for any type of website or blog. Can _____ WordPress theme be used as a website? Any of our Wordpress themes can be set up as a website with a homepage, even if the blog is displayed on the front page of the demo. Our themes are very flexible and can be set up in a multitude of ways. On the flipside, if a theme demo is set up as a website already, it's possible to use the theme as just a blog. Can I change the colors + fonts? In our Blogger templates, the colors and fonts can be changed at Blogger > Template > Customize > Advanced. I'm new to Wordpress and don't know how to use it... help! How does purchasing a Wordpress theme work? 1. Purchase your favorite 17th Avenue Wordpress theme. 2. After placing your order, you'll be able to download your theme right away and start working on your site. 3. Unzip your theme file to access the Genesis Framework and child theme inside. 5. Launch your beautiful new website!